This article originally ran on Current.com. Since the first residents descended upon Zuccotti Park in lower Manhattan, the Occupy Wall Street movement has grown from a few hundred supporters in this tiny enclave to an international discussion. With thousands of people in cities across the globe – from New York to London to Sydney to Rome – announcing their support for economic parity, it’s not all surprising several narratives have emerged. In the past week, New York City’s mayor, Mike Bloomberg, ordered NYPD to remove the protesters by force, UC Davis police officer John Pike needlessly and cowardly spraying pepper spray at sitting, peaceful students, and Seattle’s Finest shocked the world by pepper-spraying Dorli Rainey, 84-year-old who was at an Occupy Seattle protest. These provide yet additional stirring narratives, but ultimately, as in any public relations campaign, narrative and message need to be focused. One of the early narratives has been that, ironically, the Occupy Wall Street supporters have no message. Politicians and business leaders are always advised, “It’s about the message.” The same holds true for the Occupy Movement. But what happens when there are no specific, actionable messages, but broad, and often divergent messages? What happens when the messages aren’t created by the organization, but those who write about them? Does having a message even matter? The short answer is, yes, messaging matters. The longer answer for this particular case is, unfortunately, not as simple. What does matter, however, are the narratives created through the actions of the actors involved and how the audience perceives these narratives. In other words, will the Occupy Wall Street movement get support because of, or despite, these narratives? Up until now, there really has been one main narrative. But that should change. So far, the protests throughout the nation have focused their ire on those they believe have, because of their greed and malfeasance, destroyed our society. The narrative from the protesters has been about holding those in charge of particular companies (Goldman, BoA, etc) accountable for making the vast majority of Americans, in one way or another, suffer – to lose their jobs, their homes, their sense of self-worth. The protesters aren’t expecting money back or to right all the wrongs through financial gain or even stern justice. The goal is to make life more equitable, to make sure that those who made obscene amounts of money off the backs of masses can never repeat their offenses. This appears to be the main narrative of the protesters, one that is both easily understood and difficult to pin down. In order to help push this narrative, a slogan was created. “We are the 99%” is a powerful slogan. But it’s also a dominant narrative, creating storylines – many of them heartbreaking, all of them relatable – about the economic disparity between those who reside in the top 1% of the wealth food-chain and the rest of us, the 99%. In broad strokes, this slogan sets the tone, and argument, that no matter where you fall – whether you make $23,000 a year or $230,000 a year, it pales in comparison to those in that top 1% (which according to Ezra Klein of the Washington Post, is, at the minimum, $516,633 per year – but let’s be real for a second; those at the bottom of the top 1% are not in the same league as those who make millions+). The implication of the top 1% is that not only do they have the wealth, but the power – or, more acutely, the ears of those who sit in power – to push forth policy and shape how business is done. Or, to put it a different way, to help the top 1% remain the top 1%, to let money beget money, and to widen the chasm between them and everyone else. This narrative, of course, has its detractors, and not just from the 1%, but also from people who misconstrue the message. Groups such as the “We are the 53%” have arisen to try to put the Occupy Wall Street protesters down by expressing their view that, while they may not be the wealthiest of people, what they have is because they work hard and abide by the rules. This group misses the point of the 99% message: everyone (except the 1%) is in the same boat – we’ve been, to put it colloquially, screwed. One of the reasons this message has stuck is because of the populist implication. If “We are the 99%” exists, it means, by definition, it crosses political, societal and economic boundaries. A progressive who earns $75,000 a year in New York City is in the same position as a conservative who earns $45,000 a year in French Lick, Indiana. This is the ultimate ‘us vs. them’ message. But how do you deliver a message that does not get diluted and reaches a wide range of ideologically different people? The Occupy Movement has taken advantage of today’s message disseminating tools. Understanding large media outlets will either ignore or confuse their message, the Movement has taken to the social networks with compelling stories to support the 99% narrative. They’ve created a Twitter account, Tumblr feed,Facebook page to help tell their stories. However, as any politician or corporate executive faced with a determined media can attest to, distributing the message and controlling the message are two different things. Especially when uncertainty within the media runs high. According to The New York Times’ Nate Silver, on the first day of the protests, September 17, there were 10 “traditional news accounts” and remained just as low for the next eight days. (Conversely, the first day of Tea Party protests, April 15, 2009, there were 769 media hits, or mentions.) The first big burst in coverage was when NYPD used pepper spray for the first time. This is where the media narrative begins. These early reports were quick to deride the protesters and their ideas as nothingmore than hippy drivel. When, on October 1, protesters shut down the Brooklyn Bridge and the NYPD arrested many, including a Times freelancer, mentions of the movement skyrocketed and media’s questions of the movement went something like this: who are they? What do they want? What do they stand for? Are they serious? The media often creates the narrative through their reporting; the descriptors they use, the frequency of these words and pieces, all shape how the audience perceives the story. As the Occupy movement spreads across the nation and local and national media pick up on these protests, a shift will occur. In favor or against will be determined by how the press frames these stories. Will we see police brutality on protesters or will we see inarticulate protesters interviewed as spokespeople of a movement? As mentioned earlier, this week saw a rise in intensity of the ‘police brutality’ narrative. Police departments in New York City, Oakland, Portland, Ore., and at UC Davis, through their actions of apparently random and particularly vicious acts of reprobation, have created (or, sustained, depending who you speak to) the image of the protesters as defenseless voices participating in non-violent actions. When our nation’s top diplomat espouses words of warning to despots around the world about allowing their citizens to gather peacefully and exchange ideas, but law enforcers in the United States seem to find them inconvenient at best, meaningless at worst, the ‘police state’ narrative only strengthens. The images from Oakland – those of protesters shot point-blank in the face with rubber bullets, those of smoke-filled streets, the images from New York – those of protesters bending over in agony from being sprayed in the face with pepper spray, those of thousands of people in the nation’s densest city walking up Broadway – do more to inspire empathy from people than demands of inequity. Couple these images with stats of economic disparity, as well as language from ordinary people who have lost everything, then have them spread from platform to platform, from device to device, and watch how angry people can get. The whole world has the ability to watch. Then think about how, after coming home from work or school, people sit around the dinner table talking about what they saw online: “Hey, did you see what happened in San Francisco today?” much in the same way people sat at the dinner table a generation ago and watched the mass medium of the day, television, as their brothers, fathers, neighbors come home from Vietnam in body bags. Images matter. They tell a story. The protest movement has migrated to scores of U.S. cities, and besides the general debate within the group (how do we define ourselves? Where do we see this going? Etc), the underlying current is not the what, i.e. the message, but the how. With the use of social tools to exponentially deliver both the protester’s messages and aggressive response from police and politicians, Occupy Wall Street is creating a narrative that is relatable: we are pursuing our First Amendment rights and look what the government is doing. They’re shooting at us, arresting us for peacefully assembling. This narrative is a strong one. 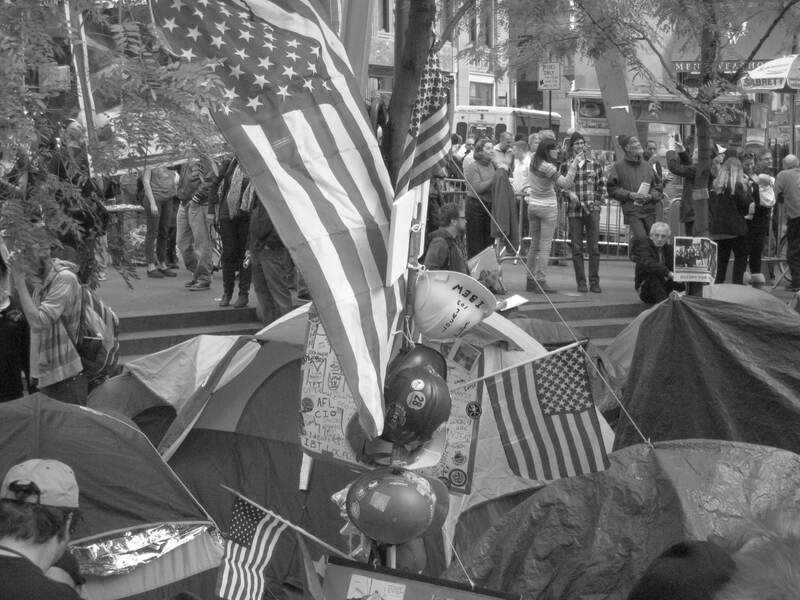 The narratives of Occupy Wall Street are at an inflection point, where the story intertwines with the outcry of the public, the vitriol against business leaders and the repudiation of our elected officials. Make the story about bad business and bad politics, where even if you like your representative, admit they have failed you. With mayors across the nation taking action to rid their cities of protests, the Occupy movement can now focus its attention on affecting real change by shifting the narrative to those in office.